Many of us got into journalism because we wanted to uncover wrongdoings, keep the public informed, and explore worlds others were reluctant to navigate. It’s easy to lose that sense of mission along he way — but Carol Rosenberg never has. She has fought against injustice and government secrecy in one of the most difficult places in the world — Guantanamo Bay. Rosenberg, The Miami Herald military affairs correspondent, earlier covered the Middle East, Washington and, more broadly, foreign affairs for the paper, where she has worked since 1990. She was a professional journalism fellow and Stanford in 1994 and 1995. Earlier, she worked for UPI in Massachusetts, New York, Washington and Jerusalem. We honor her tonight for her singular coverage of the Guantanamo Bay detention center and related controversies — since before the arrival of the first prisoners there in 2002. Although one of a handful of journalists banned by the Pentagon from covering the lives and trials of the detainees, she has overcome every obstical — physical and bureaucratic — and has now spent hundreds of nights at the dentention center, more than any other reporter. Congratulations on being an honoree at the 2014 First Amendment Awards Dinner. Your work over the years, in particular your coverage of Guantanamo Bay, has set a high bar, In this and other hard assignments, you displayed tenacity, courage, and a fierce defense of freedom of the press. I am honored to add to the many who stand in admiration of your achievements and remarkable public service. As you celebrate this moment with your family, friends, and coworkers, please know this former Commander of JTF-Guantanamo is proud of his association with you. Again, congratulations and best wishes for your continued success. Admiral Harris’ tribute proved that you can be as tough and demanding a reporter as Carol — and still earn the respect and admiration of those you cover. In fact, it is a necessary condition of achieving the superb level of journalism she exhibits day in and day out, under the most arduous conditions. Carol has demonstrated an unflinching devotion to the highest principles of journalism. 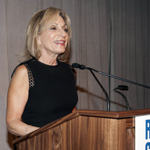 For that reason, and many more, it is my great honor to present Carol Rosenberg the Reporters Committee for Freedom of the Press 2014 [First Amendment] Award.